Central Virginia is vulnerable to power outages from wind, snow, storms, and other natural disasters. A reliable whole house standby generator will automatically supply power to your circuit breaker box during an outage and shuts off when power is restored. It is a safer emergency power solution that operates on natural gas or liquid propane compared to portable gasoline generators. A home generator will keep your electricity on when you need it most. 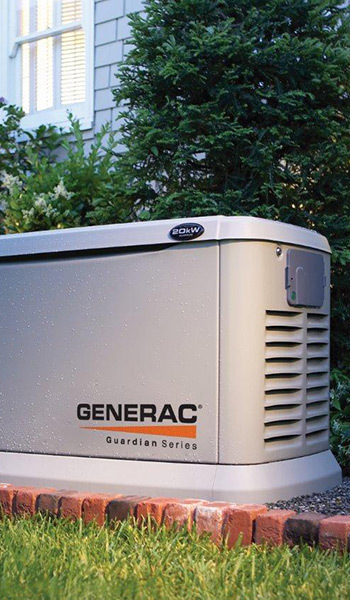 Wooldridge is proud to sell and service Generac, the world’s #1 provider of residential standby generators. We are an elite PowerPro dealer regulated by Generac requirements, have 24/7 network support and access to parts inventory. Our consultants will help determine your level of coverage, from essential, managed or complete whole house coverage. Home generator power by Generac – the best brand of home generator! Stay ahead of the weather and call Wooldridge Heating, Air & Electrical for a consultation.